When asked what was the key to his success at Carlisle Indian School, Pop Warner famously answered that it was the absence of alumni. While this statement is not literally true, it is correct in the context in which it was made. 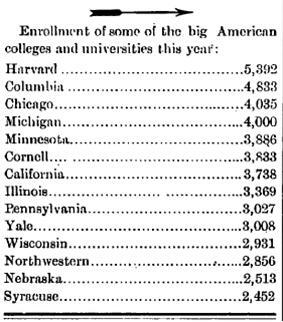 Of course Carlisle had alumni, but what it didn’t have were alumni associations, major alumni donors and influential alumni with the ability to influence the direction of the athletic department. 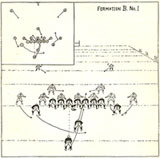 Warner was thus able to run the football team the way he saw fit. He didn’t have to deal with alumni interference as he had at Cornell. He felt blessed by its absence. One of the changes that took place after the 1914 congressional investigation of Carlisle was the formation of an Alumni Department. Reorganization may be a more accurate word, but any previous organization may have had so few resources that it was barely active. After the dust settled on the changes made following the investigation, the building that formerly housed the Native Art Department was given to the Alumni Department for its home. A curriculum change a couple of years prior had eliminated the Native Art Department but had not reassigned the building. Lone Star Dietz had been reassigned to teach mechanical drawing and Angel DeCora had a sinecure. The building that still stands on Carlisle Barracks opposite Pop Warner’s home just inside the former entrance to the school had become a hangout for students and was apparently not being put to a constructive use. The alumni Department quickly ordered a large pennant for each of the graduating classes to that time and hung them around the walls. Student crafts were removed from the building and replaced with souvenirs purchased in New York. The Alumni Department was allocated a few pages in each issue of The Red Man, Carlisle’s monthly literary journal. The Masthead for that section is shown below. The reason I thought about the Alumni Department is that I recently received a phone call from a local collector who had just purchased a plate from the Carlisle Alumni Department at a sale. He wasn’t sure that it was legitimate but took a small gamble and bought it. I haven’t seen it yet but his verbal description sounds familiar to the artwork on the masthead. 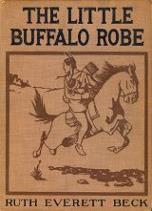 This week Jim Thorpe’s biographer returned to Carlisle to pick up his new suit. Mose Blumenthal was a tailor at the Carlisle Indian School and also outfitted students in civilian clothes at his haberdashery, The Capital. 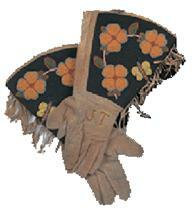 Today that store is operated by Freddie Wardecker and sports Indian School memorabilia on its walls. My hope was that in the basement or attic Freddie would find a suit of the style worn by Jim Thorpe for Bob. But that wasn’t to be. Bob had to settle for a dark business suit that is appropriate for almost any occasion. He topped it off with a Lone Star Dietz signature tie that is perfect for wearing at book talks. It should also be a hit in his home state of Texas. Although photos were taken they can’t be posted because they turned out too dark, probably due to photographer error. While in town Bob and Florence visited several sites related to Jim Thorpe. Their first stop was Carlisle Barracks to see the former Indian School buildings and, of course, Indian Field. It was too late in the day for taking photographs so Bob returned the next day before leaving town. Prior to visiting the graveyard we mistakenly thought the graves were all of students who died while attending the school. However, we noticed that a couple of rows of the graves appeared to be for soldiers who had been stationed at Carlisle Barracks. Surprisingly, some of the dates on a few of the tombstones were relatively recent, after the Indian School had closed. Sadly, most of the grave markers contained little information about the person. Having more information would helpful. For instance, one marker only provides the name, Paul Wheelock. 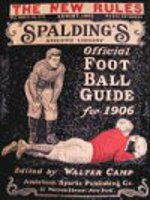 From researching a cousin who played football and was a pallbearer for Paul, I know that he was the infant son of Bandmaster Dennison Wheelock. Did the baby’s death cause the father to leave Carlisle or was it coincidental with another opportunity arising? The shortage of information makes it difficult to answer that question. Bob and Florence also visited Whistlestop Bookshop and Cumberland County Historical Society. It would be great if we could get Bob, Flo and our local folks to coordinate a talk the next time they are in town. I, for one, hope we don’t have to wait until next tennis season. In March 2005 Anthony Barone, Jr. found a ticket in a book he had purchased for $6.00 at an auction. 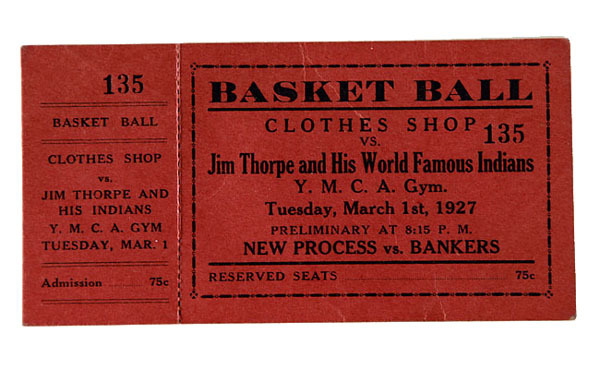 What is remarkable about this unusual event is that a ticket to a March 1, 1927 basketball game involving Jim Thorpe and his World Famous Indians dropped out of the book. Big Jim’s involvement in March Madness is not much known about today although it was covered in newspapers of the day. When Jim first started playing basketball is not known. The first known documentation of his playing on the Freshman Class and Carlisle Indian School varsity teams in January 1909. So, Jim played hoops competitively long before the ticket date. If he played competitively after the 1909 season is not known either. However, he definitely played in 1927. Although the team was advertised as being an Indian team, the closest two of the team’s stars got to being Indians was to have lived in Indiana. The WFI played a heavy schedule of games in the Midwest and east. At 39, Jim was nearing the end of his competitive athletic career so didn’t play full games as he had when he was young. A quarter of intense exercise on the court was enough for him. As of March 31, 1927 Jim Thorpe’s hoopsters were 42-14 with the season not yet finished and baseball just around the corner. Instead of barnstorming with an all-Indian team that summer, Jim played baseball with a team of college players he and Ohio State University star Chic Harley put together. Pardon me while I go off topic. I promise not to do this frequently. Watching the NCAA championship game Monday night brought back some memories – not as a player, besides being short, I was not very good – growing up in downstate Illinois. You see, the term “March Madness” was coined in Illinois to describe its then wide-open high school basketball tournament. This format gave even the smallest schools a shot at beating the large schools and sometimes David won. 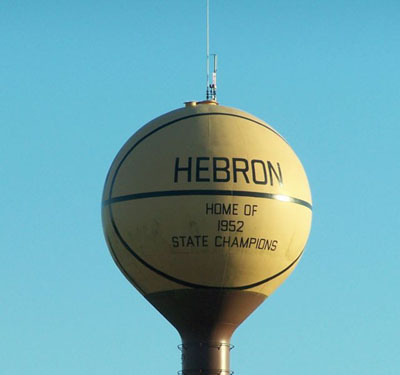 In 1952 Hebron, with a student population of 98, beat Quincy in overtime to become the smallest school to be state champions. The town continues to celebrate the Green Giants’ victory on their globe-shaped water tower that is painted to resemble a basketball. I recall the 1964 Cobden Appleknockers’ run for glory. This four-year high school boasting a student body of 128, half of which were girls, fielded a team that included two brothers and three cousins. The team dedicated its season to starting guard Tom Crowell who had drowned. The Appleknockers did not win it all, losing 50-45 to the Pekin Chinks. I don’t tease anyone about their team’s name because our local high school, Boiling Springs, calls its teams the Bubblers. During the introductions I noticed that Ed Hightower was one of the officials. While attending graduate school at Indiana University I observed that he officiated many of their games. Someone with season tickets informed me that Indiana officials – read Bobby Knight – considered him to be the best. I recalled the Hightower name from one of the old guys who held court in the closest thing we had to a malt shop. He praised the play of a Hightower who had played for nearby Alton High some years prior. I never saw or heard much more about Hightower the basketball player. My wife and I notice that Ed Hightower still works a lot of Indiana and Texas Tech games. A few years ago she noticed that Ed was developing male pattern baldness. After this year’s March Madness subsided I looked up Ed Hightower on the internet and found that he is too young to be the person those guys were talking about. However, his day job is as Superintendent of Edwardsville, Illinois schools, the same district that I attended from grades 4 through 9. He is also on the Board of Trustees for Southern Illinois at Edwardsville where I got my bachelor’s degree some decades ago. Seeing Ed officiate those games brings back memories of following snow plows to important games and waiting for a repair crew to replace a backboard shattered in pre-game warm-ups. Although Ed Hightower has received awards for his work, the Golden Whistle most notable, and has been selected to work twelve Final Fours, his job has not always been the easiest. A notable example was the game he worked in which Chris Webber called a timeout he didn’t have. He has missed games due to injury but at least, as my wife noticed, his baldness seems to have gone away. 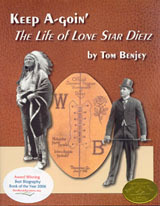 A mystery has haunted me since shortly after starting to research Lone Star Dietz’s life. Today, with the help of Freddie Wardecker, proprietor of Wardecker’s Mens Wear and Jim Thorpe Museum, and Bob Wheeler, Jim Thorpe’s biographer who, along with his wife Florence Ridlon, succeeded in getting Thorpe’s Olympic medals restored, I solved that mystery. Lone Star Dietz died in 1964 and his wife, Doris, died three years later. Mary Lou Zientek had befriended the Dietzes and served as executrix of Doris’s estate. The estate consisted mostly of Lone Star’s memorabilia that included promotional photos for his movies and a pair of Jim Thorpe’s gloves. Mrs. Zientek donated many of the items from the Dietz estate to a museum in Pittsburgh. I was unsuccessful in locating any of these items in any museum in Pittsburgh. Today that changed. One item jumped out at me. I could never understand why Lone Star had a pair of Jim Thorpe’s gloves or why he would have kept them so long because I thought they were just ordinary men’s gloves. Well, these are not ordinary gloves. Seeing them will explain everything. The photo shows other items related to Jim Thorpe’s time in Carlisle. Now that the Cumberland County Historical Society has funds for acquiring artifacts, perhaps they can bring Jim Thorpe’s jersey, letter sweater, gloves and other items back to where they belong. Every so often I am blessed by an email that comes out of the blue from a person I don’t know or have ever heard of before that brightens my day (or several days) considerably. One such message came from Barr Shriver. Mr. Shriver’s grandparents, Barr and Marie Cox “Nana” Crawford, lived in the same apartment building in Pittsburgh as the Dietzes for several years in the early 1950s. Barr’s grandparents and the Dietzes became good friends during this period. Barr Crawford worked in the truck parts department at Hoover Dam during its construction and made friends with many Indians. When he worked as a salesman with International Harvester (IH) during the Great Depression, the Indians didn’t have enough money to pay for the repair parts they needed. So, Mr. Crawford allowed them to trade beautiful blankets and art for the parts needed to keep their trucks running. 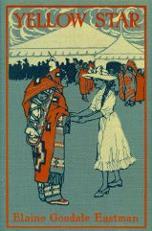 Having grown up in Montana, the Crawfords appreciated Indian art and understood the hardships Indians had undergone. Seeing Lone Star’s artwork, they struck a deal with him. Their son-in-law, Barr Shriver’s father, was a hunter and supplied two deer hides that he had had tanned and Lone Star had them mounted as if they were canvases and trimmed to about 14 by 16 inches. On one he painted a bust of an Indian woman and on the other a self-portrait in his war shirt and headdress. He signed the colorful paintings with the distinctive signature he used on his artwork at Carlisle. After the Crawfords died, the paintings passed to Barr Shriver’s mother, their daughter. One of the things I mourn is that much of Lone Star’s art has been lost over the years. That, fortunately, is not the case this time. The Shrivers are proud to have and appreciate what are two-of-a-kind paintings and family heirlooms. 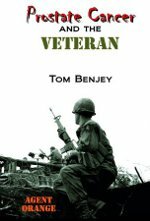 At long last an oversight or, as many view it, a snubbing is being corrected. Lone Star Dietz should have been inducted into the College Football Hall of Fame decades ago but hasn’t been. Some view this as just another example of Indians being abused by white men. Dietz has been inducted into a number of halls of fame including the prestigious Helms Athletic Foundation Hall of Fame back in the 1970s. His role in establishing the New Year’s Day football tradition, most notably the Rose Bowl, is reason enough to induct him. But that’s not all. His won-loss record qualifies him for induction and that’s saying something. Lone Star Dietz did not nestle into a successful program and ride that horse for decades; he undertook a number of reconstruction efforts and turned programs around. On the few occasions he couldn’t turn a perpetual loser into a winner, he got the student body excited. So, why hasn’t he been inducted? Until a few years ago the Hall had his record wrong and didn’t consider him qualified. Now that the record has been corrected he is eligible and his name has been on the ballot. A couple of years ago he came close but while the ballots were being counted, the Honors Committee (now that’s a dubious name) decided they wanted to induct Joe Paterno and Bobby Bowden. There was one hitch: Paterno and Bowden’s names weren’t on the ballot because, as active coaches, they weren’t eligible. That problem was easily dealt with. All they had to do was to change the rules in midstream. Presto! Paterno and Bowden were eligible and the men whose names were actually on the ballot were forgotten. Sorry, Lone Star. But this year he’s getting a fair shake and is belatedly being inducted. Perhaps this will lift the Lone Star Curse from Washington State.